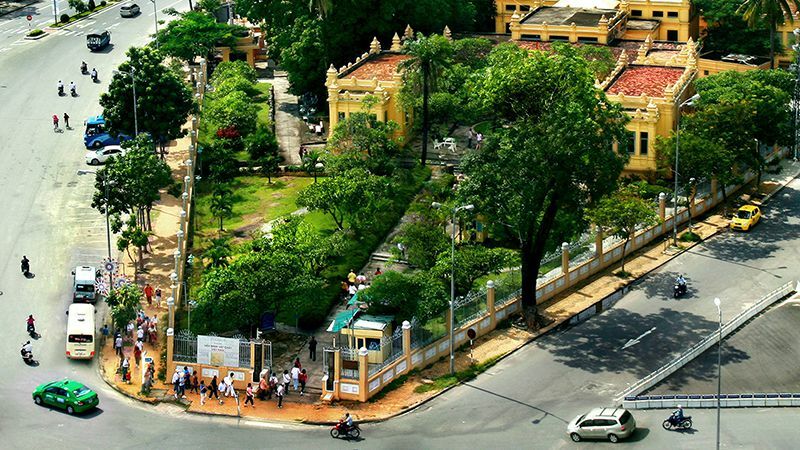 The Cham Museum is the main attraction of Da Nang and is worth the trip, even if you're coming all the way from Hoi An for it alone. This old sandstone building houses the world's largest collection of Cham art and sculpture, and was established in 1919 by the Ecole Francais d'Extreme-Orient (EFEO). Da Nang was chosen as the location due to its proximity to the former kingdom of Champa, My Son and Tra Kieu. The museum follows Cham architectural themes, and was enlarged in 1936 as its collection increased. More than 400 original pieces of sculpture and text documents spanning the fifth to the 15th centuries are on show. Each of the museum's ten rooms bears the name of the district in which the relics were found. For us the most impressive exhibit is a huge stone Buddhist pedestal (the one with the missing head) sitting with his hands on his knees with his feet flat on the ground. It depicts the Champa king of Indrapura who was the only Buddhist Champa king; this is an unusual image of a Buddha sitting in a chair. Look closely and you'll see that every available surface is intricately carved, with images related to the Buddha's life -- a huge artistic diary.